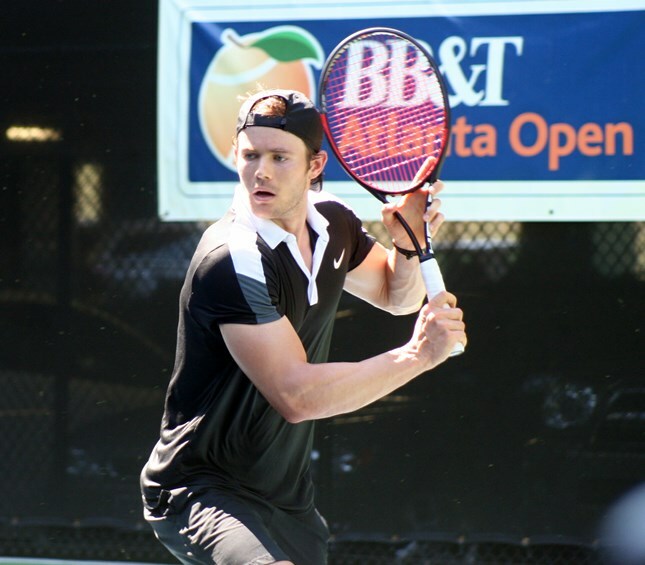 Former Samford men's tennis player Zac Dunkle earned a break late in the third set and defeated Harvard bound, Galen Lee, of Woodstock, Ga., 4-6, 7-6(6), 6-4, in the first semifinal of the 2016 BB&T Atlanta Open Wildcard Challenge, held on Tuesday on the new practice courts at Atlantic Station in Midtown, Atlanta. Christopher Eubanks, a rising junior on the Georgia Tech Men's Tennis Team defeated his fellow teammate at Georgia Tech, Cole Fiegel, 6-3, 1-6, 6-1, to also advance to the final match on Wednesday. Although Lee took the early advantage on by breaking at 4-4 in the first set, and then saving break points and serving out the opener, it was Dunkle’s endurance in the second and third sets that proved to be most important. After taking the second set in a tiebreaker Dunkle secured the match victory by a break of serve at 5-5 followed by a solid hold in the last game. Dunkle will face Eubanks of Georgia Tech in the final match of the Wildcard Challenge, to decide who will take the last spot in the BB&T Atlanta Open qualifying tournament. Eubanks, depending on his big serve, outplayed his fellow Yellow Jacket in a match marked with a great and friendly competitive spirit. Even though the teammates were on opposite sides of the court, both players exhibited notable sportsmanlike conduct throughout the match and the fans in attendance showed their appreciation. Eubanks takes on Dunkle, Wednesday, July 27 at 10 am, on the practice courts of Atlantic Station in the Wildcard Challenge final. The winner will earn a spot in the BB&T Atlanta Open Qualifying draw, which begins play on July 30.